If you've never made a touch quilt, we will show you how. 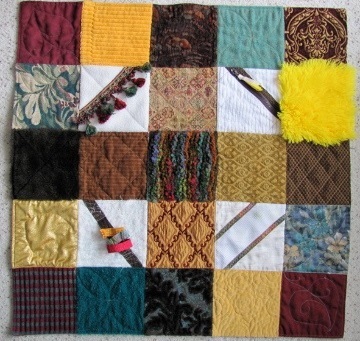 If you are interested in helping to make a crazy touch quilt, we can do that. We already have two crazy blocks made. I think we can finish the quilt at the workshop. You can simply gather the makings and sew with your friends. OVQG provides a good supply of textured fabrics and backing materials. Please note: that we are always grateful for donated fabrics and embellishments. Bring your lunch, sewing machine, supplies, and if you want, fabric for the toy blocks.